Let me start off by saying that I gobbled up this 700+ page tome in about three days. It will surely hold a place in the top five best books that I’ve read in recent years. I’ve read some of Simmons’ work previously: the Hyperion and Endymion Sci-Fi books, and also Drood. All were enjoyable. Drood was quite entertaining. However, The Terror, in my opinion, was just outstanding. Like Drood, it is a fictionalized enhancement or re-telling of actual events. Specifically, it is about Sir John Franklin‘s doomed expedition to the Arctic in 1847 to seek out the fabled Northwest Passage. Progress toward discovering the passage had been made by previous expeditions, but none so seemingly well-stocked and determined. Franklin took two ships, HMS Erebus and her sister ship HMS Terror, into the Arctic in the late summer months of 1847. Neither the ships nor their crews were ever seen again by any white man’s eyes. That’s the mystery of the Lost Expedition. Simmons takes the historical personages and weaves them into an intricately plotted thriller which brings these people back to life for us, the readers. His own spin on the personalities of the historical figures and the completely fictional characters is wonderfully rich. After reading this book, you’ll feel that you actually spent time with Captain Francis Crozier of the HMS Terror; or Lady Silence, the mysterious Eskimo woman; or Dr. Goodsir, HMS Erebus’ assistant ship’s surgeon. The way Simmons uses real life events and facts as a foundation for this story often confuses the reader into thinking they’re actually reading about true events. That’s the magic of Simmons’ alternate history thrillers like this book and Drood. He’s written some others in this vein also. I plan on reading them in the future, for sure. 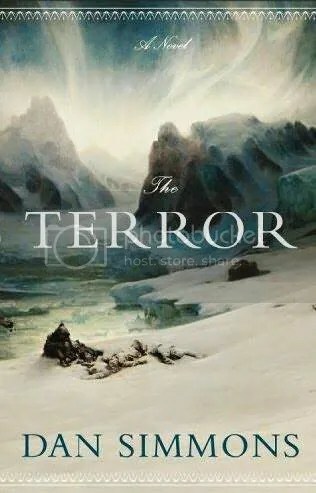 If you’re looking for a good book to curl up with this cold and dark winter, I most definitely recommend Dan Simmons’ The Terror to you. Posted by V. T. Eric Layton on 9 November 2011 in Books and Literature and tagged book review, Dan Simmons, Drood, Francis Crozier, H.D.S. Goodsir, Sir John Franklin's Lost Expedition, The Terror. That book sounds really good! I will definitely be looking out for that one! Cool! If you enjoy reading about history, exploration, early American life and life in France in the same period, you will really enjoy the book, I think. I loved it!